Annual Passover music festival will feature Jubilee events for the 1967 liberation of Hebron. The year was 1967 and for the first time in 700 years the public had access to the ancient burial site of the Biblical Matriarchs and Patriachs. This year's annual Passover music festival will celebrate that historic moment in Jewish history. Appearances will be made by Israel's two chief rabbis, Members of Knesset, mayors, and popular musicians. The celebration will be held on Monday April 25, 2016 at the Tomb of Machpela plaza in Hebron starting at 3:00 PM. Organizers see this event as landmarking the liberation of one of the oldest Jewish communities in the world. Half a century later, Hebron has been transformed into a cultural and historic center that attracts over 700,000 tourists each year. Sites such as the Tomb of Jesse and Ruth, the Avraham Avinu Synagogue, Beit Romano and other landmarks from the "Old Yishuv" have since been refurbished and are now regular use and part of the permanent revived community. The Tomb of Machpela, arguably the oldest still-functioning structure from its era. The founders of monotheism, Abraham, Isaac and Jacob and their respective wives, Sarah, Rebecca and Leah, are buried in its underground double cave. The walls of the Machpela complex were built by King Herod the Great using the same techniques used to built the Western Wall and Temple Mount in Jerusalem, as evidence by the "Herodian stone" style of bricks. The site was restricted starting in 1267 by the Mamelukes and throughout the Ottoman Empire and British Mandate periods. Only on rare occasions and with a steep entry fee were Jewish visitors allowed in. The Jewish community was evicted after the 1929 massacre and their property confiscated. After the 1948 War of Independence, the city was completely cut off by the Hashemite Kingdom of Jordan. Today the Tomb of Machpela is accessible to people of all faiths because of the events of 1967 and the continued dedication of the pioneering Jewish Community of Hebron. As in previous years, the highlight of the day will be the concert in which popular artists from Israel and abroad will perform. In past years approximately 50,000 have visited over the Pesach holiday. Artists who have performed in Hebron in the past have included, Mordechai Ben David, Sarit Hadad, Amir Benayoun, Shlomo Katz, the Kinderlach, Yonatan & Aharon Razel and Yishai Ribo. 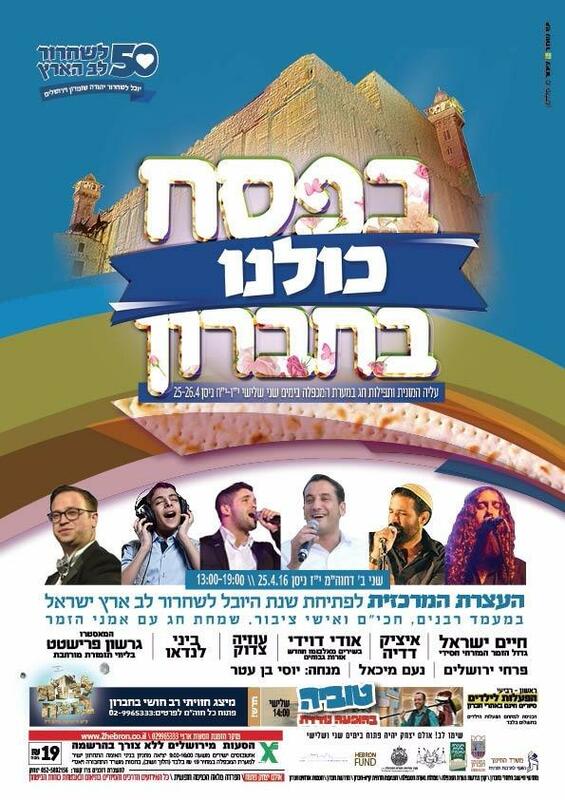 This year's perfomers will be Haim Israel, Itzik Dadya, Udi Davidi, Bini Landau, Uziah Tzadok, Gershon Freishtat, Pirchei Yerushalayim, and more. The Tomb of Machpela will be open in its entirety, which happens only ten times a year. This includes the Isaac and Rebecca Hall, the largest room in the complex, with the entrance to the actual caves. Tours of historic sites in Hebron will be held as well as childrens activities, and screenings of the new 4D movie about Hebron's history entitled 'Touching Eternity'. 2016 is sure to be a memorable chol hamoed Passover, visit Hebron for a once-in-a-lifetime event that will connect the past to the future.